"For two years I had been battling Pre-Diabetes. After changing my eating habits, losing 15 pounds (I now weigh 124) and walking 3 miles a day my AIC was worse than it had been 6 months before. Three months after starting Glucose Reduce, my glucose is under control, my AIC went down below 6 and I am no longer considered pre-diabetic. I refused to take prescription drugs and am so happy that I found an alternative! Thank you!!" "Yes (works) very well - looking back on my feeling down after a meal, I no longer have these symptoms because of "Glucose Reduce" and I really appreciate Dr. Brownstein and his good advice." "I am pre-diabetic, and it has reduced my blood sugar." " Yes, I believe it has helped reduce my blood sguar. I am a PRE-diabetic & must take the count every morning. The count is usually between 100 & 107. Since Taking Glucose Reduce the numbers have been around 95, 96, 98. I will continue taking Glucose Reduce to see if the numbers can reduce to somewhere in the 80's. Thank you very much." "I have noticed a reduction of my blood Glucose level by about 20 points"
"The only "drug" I take is for diabetes. The first 90 days I was on Actoplus Metformine along with the Glucose Reduce. I also tweaked my "Mediterranean diet". At 90 day checkup average B.G. was 90-130 from 300 range...so I have to say YES!" "I believe so. My last blood test, sugar level was 105....still border-line. Cholesterol, however, was considerably lower than before started Glucose Reduce. Have no symptoms of diabetes at this time. I'll continue Glucose Reduce....and I've referred a number of friends to your website & 800 phone number." "It has taken awhile to work but it seems to be doing better now, I have been on a trip for 10 days and did not it take as I should, but I am doing better now so I have decided to keep taking it. " 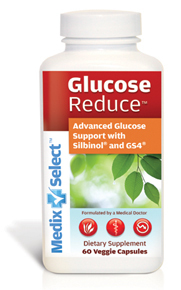 "It (Glucose Reduce) is working great. After years of not being able to get my sugar in the normal range it is now very good, only one high of 176 in the last month."